ARTISTRY OF DESIGN AND SEAMLESS BEAUTY IN THIS CUSTOM BUILT HOME ON THE MANATEE RIVER! NO EXPENSE WAS SPARED IN CREATING THIS MASTERPIECE!!! Private gated entry leads to the courtyard with a custom fountain. Step inside & you will realize the quality & craftsmanship to which this home has been built. The master wing is located on the first floor with two separate sleeping retreats,library & walk in closet. The open floor plan flows easily from one room to the next. Expansive vaulted ceilings, solid core doors, porcelain tile, plantation shutters, bamboo floors & custom millwork are just some of the features in this home. Neutral tones with splashes of color compliment the interior design. An elevator ascends to the third level complete with two bedrooms each flanked by a balcony,bonus room,full bath & gathering room with kitchenette. This home is situated on the widest part of the River & has deep water at the end of your private dock with two boat lifts. The outdoor living space has an abundance of balconies & screen porches to take full advantage of the water views. The serene pool area is situated between the main house & guest house & offers complete privacy. The guest house has a living room,kitchenette & large bedroom with ensuite. 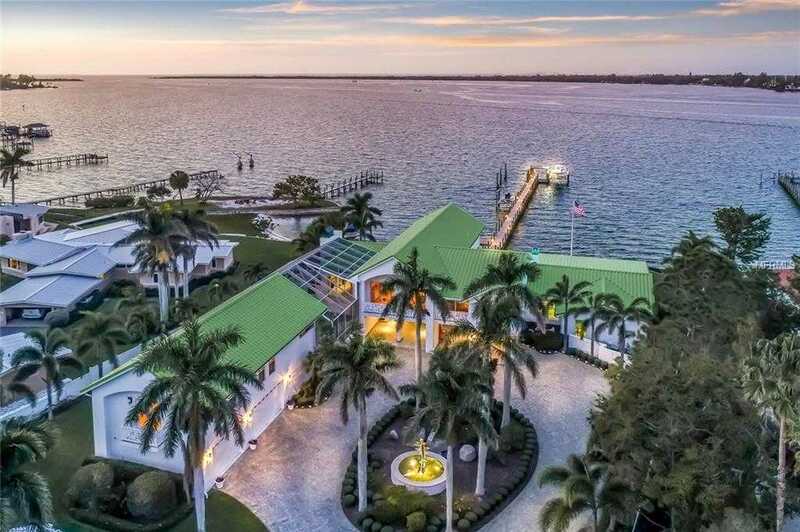 Everything about this home is simply amazing but the real magic happens when you see the views across the mile wide Manatee River. Spend a day on the water fishing or simply wind down the evening watching the sailing regattas go by while the sun sets. Mile Wide River views and across from Bradenton Yacht Club and Snead Island Boatworks. Please, send me more information on this property: MLS# A4422873 – $3,450,000 – 6100 Riverview Blvd, Bradenton, FL 34209.